Over time I have shared many of my creative projects on this blog. Often, I take you through aspects of the process - from inception to completion. The two projects listed below are still 'open' (i.e. in motion, in the works). Please see below if you are a regular reader of Now is Wow and are interested in following up on their progress and eventual outcome (beyond the blog). Habitat for Humanity has partnered with us to ensure that the house for Veronica and her children is built. Once the necessary 'red tape' is cleared (e.g. Town and Country Planning), work will officially begin. All things running smoothly, the house will be finished within 2008. Those who wish to be involved in the construction as volunteers can contact me at nowiswowisnow [at] yahoo [dot] com for further information. Or you can contact Habitat directly (see their website for contact info) and indicate your interest in being a volunteer for Veronica's House and/or other Habitat projects. You do not have to have prior construction experience. Volunteers will be needed for all kinds of tasks, from making phone calls to painting walls to more 'concrete' jobs, literally. Within the next few weeks, the designer of the Veronica's House website will update it to reflect the recent changes (as a result of Habitat coming on board as a partner). The Tree Planting Ceremony will take place as announced on Saturday 3rd May, 2008. Thus far 20 of us have confirmed our attendance and, on that day, will be making the hike up the mountain to plant the dreams which various people placed into the Dream House. I have chosen the Flamboyant as our Tree of Dreams. When the flamboyants are in bloom on the mountains, their vibrant orange presence cannot be ignored. They are visible from far and wide, like fires (i.e. fires of flowers, not flames) on the mountain range. One day our Tree will be one of those striking orange beauties, standing testament to the blooming of our Dreams. How wonderful that Habitat came on board to help build this house for this woman and her children. I am happy this is coming along so well. 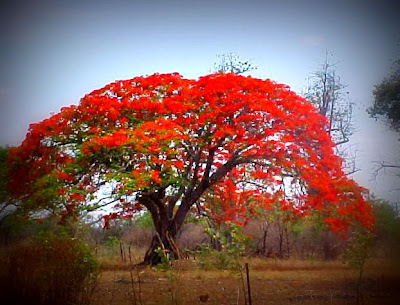 And the idea of these striking red flowering trees blooming as a result of another of your Projects is simple awesome. You are a mover and a shaker, you make things happen. I feel honored to have known you here for this short while. The world is lucky to have you in it.